PlayStation 3 owners still hanging on for new Elder Scrolls content may finally get what they've been waiting for. 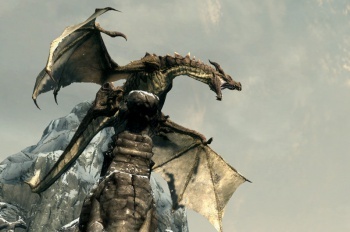 PS3 owners have been watching their Xbox-owning counterparts enjoy expanded content for the latest Elder Scrolls title since June, but it appears that Bethesda is nearly ready to show Sony's console some love. In a tweet from the company's developer account, Bethesda notes "we're also close on new Skyrim content for PS3 and PC." The PC community has a vibrant modding scene to help extend the life of titles like Skryim - and both the PC and Xbox 360 have already received a pair of DLC add-ons - but PlayStation 3 owners don't have that same luxury. As we approach the 1-year anniversary of the game's launch, gamers who long ago completed the wealth of story missions and side quests could definitely use some attention. Back in August of this year, Bethesda revealed that it was having issues getting the first DLC add-on, Dawnguard, working on the PS3, but noted that it was already working on other expansions as well. It's unclear what new content the company is planning on bringing to the system, but assurance that something is on the way should give PlayStation gamers some hope for the future of the title.